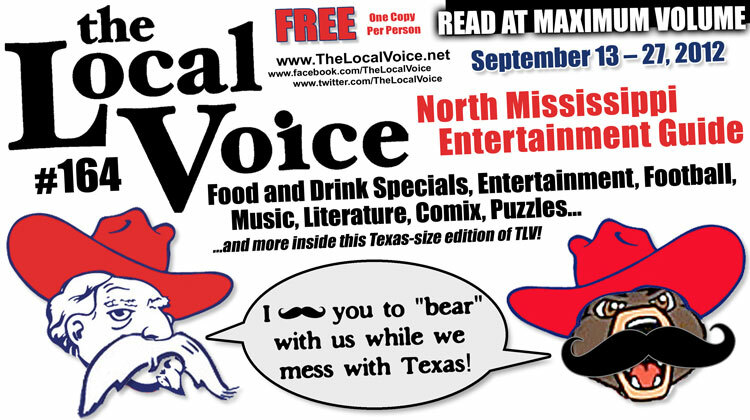 The Local Voice #164 is out now! Get more info on what’s inside HERE! from 8am til 1pm on North Lamar (across from Volta). Go get your fresh (guaranteed Mississippi-grown!) veggies and foodstuffs! Stop by for lunch and get satisfied. Ajax now has high gravity beers, including Abita Jockamo IPA in bottles and Andy Gator on tap! COLD BEER EVERY DAY INCLUDING SUNDAY! From Oxford take Highway 7 North towards Holly Springs. About a mile past the Tallahatchie Bridge, look for the first road on the left. Betty Davis is just inside Marshall County. Voted “Oxford’s Favorite Breakfast,” three years in a row! Early Bird Special from 7- 9 am today! Dine-in only. Excluding fresh squeezed juices. 7 am – 2:30 pm Monday – Friday, and 8 am – 3 pm Saturday and Sunday. 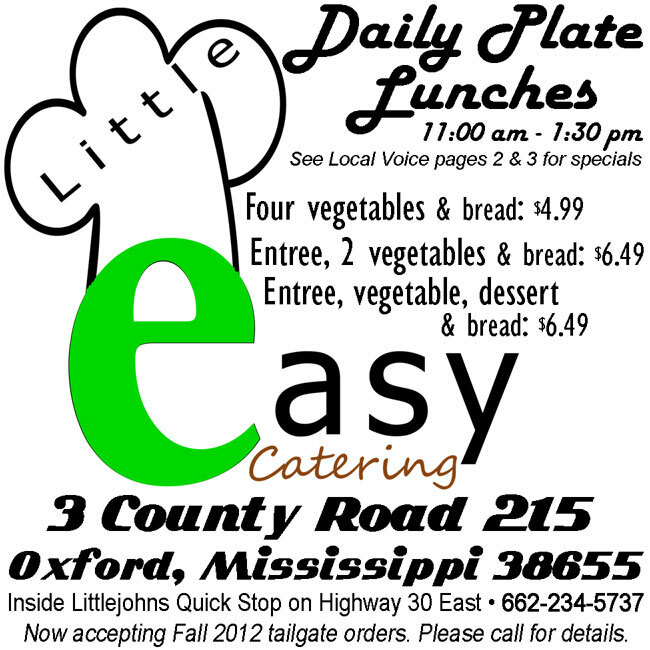 Voted “Oxford’s Favorite Sandwich,” three years in a row! Boure is now OPEN in their new location at the old Downtown Grill spot. 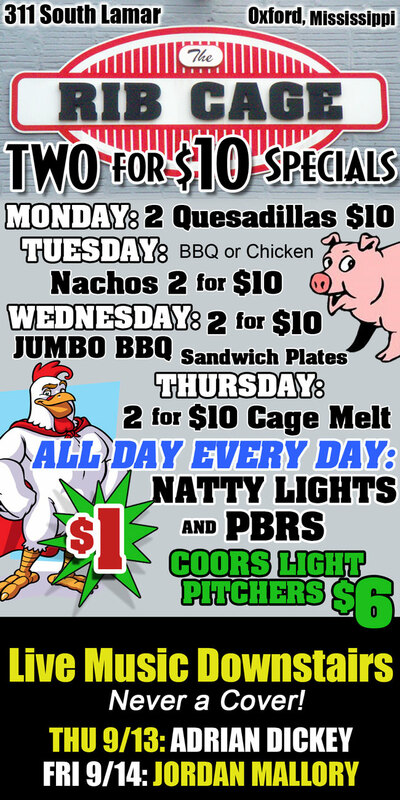 Come check out the new dining room downstairs and huge lounge and patio upstairs. Dessert: New Orleans Bread Pudding, Chocolate Chip Ice Cream Sandwich, Deep Fried Pecan Pie or Homemade Cheesecake with your choice of toppings: Blueberry, Strawberry, Chocolate, or Caramel . Check out Old Venice’s brand new menu! 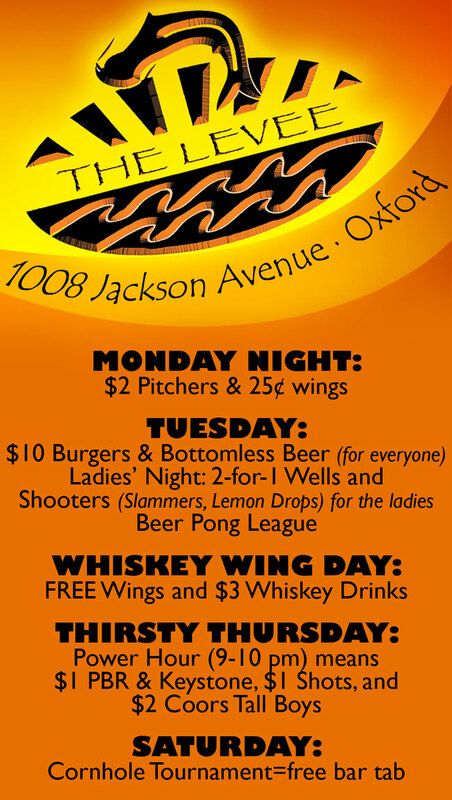 $5 for Jager Bombs, Vegas Bomb, Orange Bomb, or Car Bombs today! Celebrating 20 Years on the Oxford Square! Over 200 items on the menu! 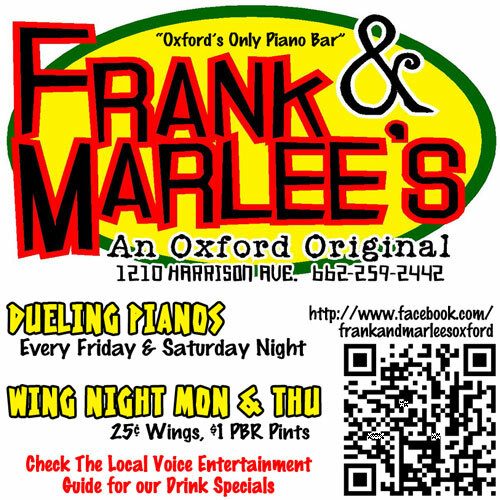 An Oxford Original featuring Dueling Pianos! plus Abita Andy Gator, Shipyard Summer Ale, and Red Brick Hoplanta in bottles! Try some of Irie’s famous homemade Seafood Gumbo and Crawfish Etoufee! plus High-Gravity Beers: Andy Gator on tap and Abita Jockamo IPA in bottles. Kids Eat Free today from 4-9 pm! The Library has LIVE SPORTS on the big screen, multiple screens, and every screen in the house. 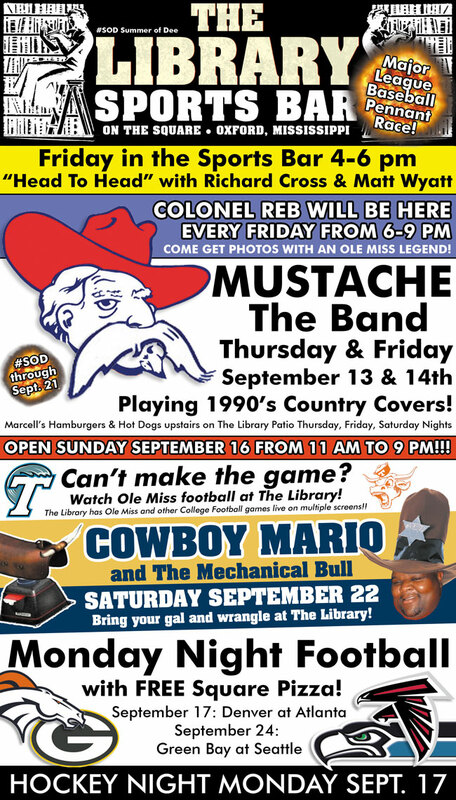 The Library has a whole bunch of screens with live sports and sports entertainment. Open at 3pm.Hang out with some of the most awesome bartenders in town at The Library! Green Beans, Rolls, Cornbread, and homemade desserts. 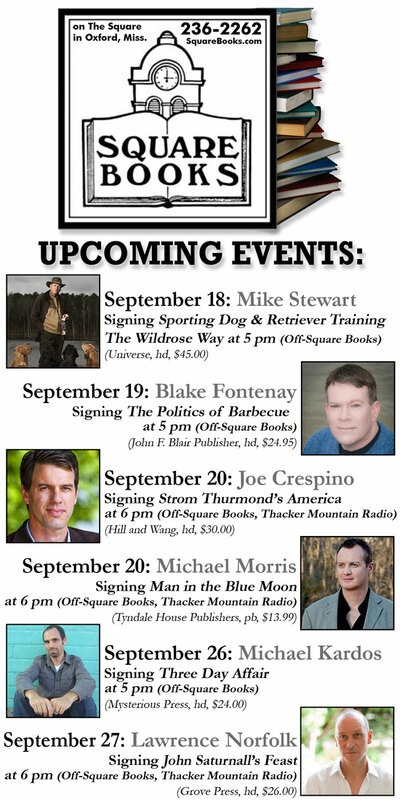 Author MICHEAL KARDOS will be signing Three Day Affair at 5 pm. Get more information on this production on The Local Voice.net! Come for the food. Stay for the music! 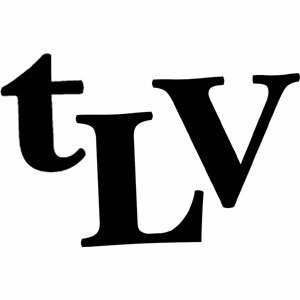 Read more about them in The Local Voice #164, or on our website here. 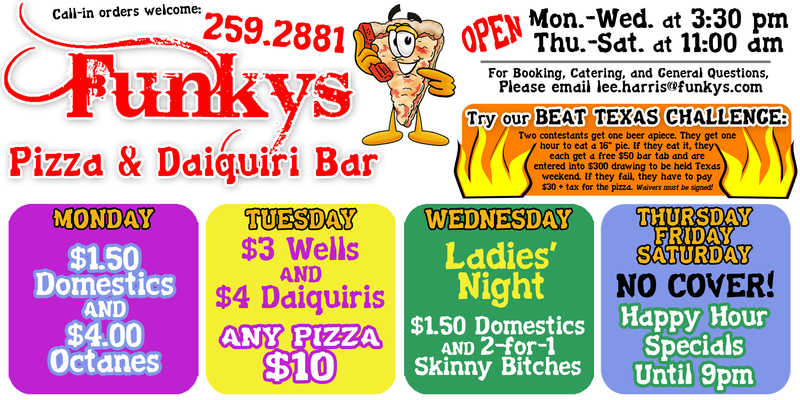 $3 Whiskey & Wine Wednesday! 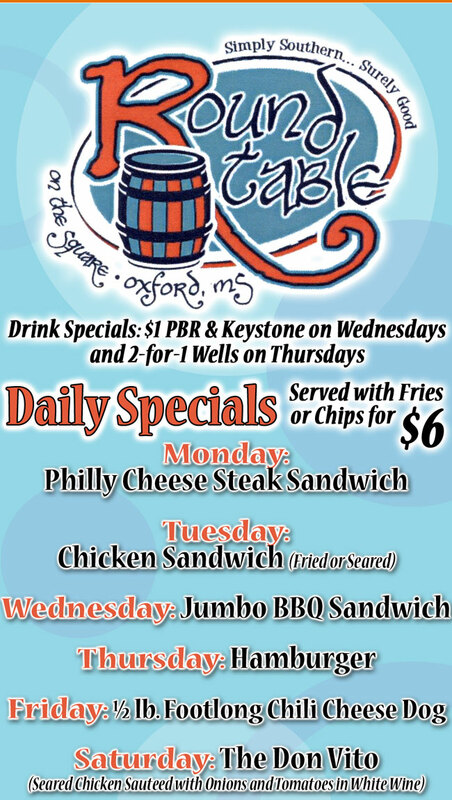 $6 Jumbo BBQ Sandwich plus chips or fries! 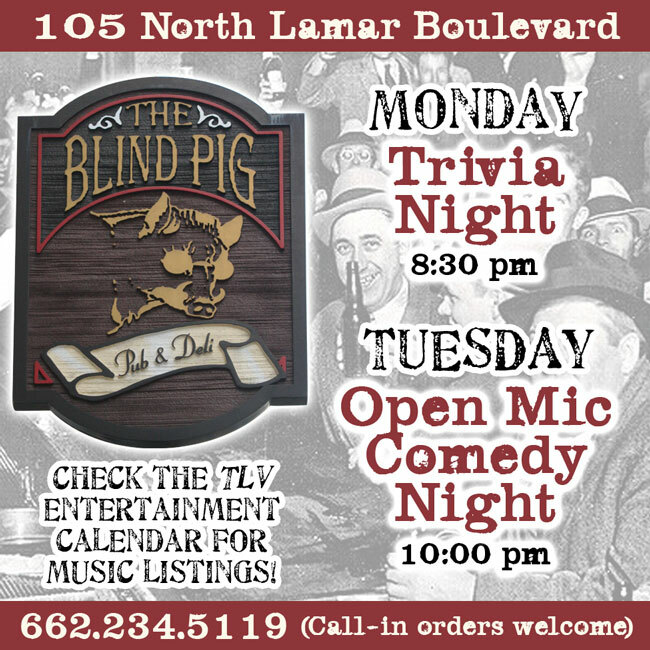 Now open at 308 South Lamar Blvd. in Oxford, Mississippi! 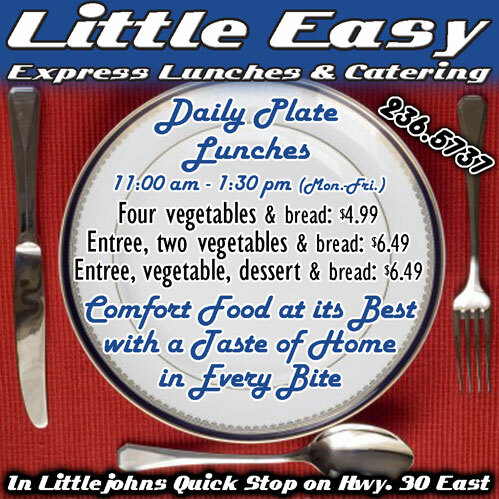 Choice of Soup or Salad, Drink, and Entree from $6.99 featuring Red Beans & Rice, Muffaletta, Spaghetti & Meat Balls, Calzones, Pizzas, and more! 1420 W. Jackson Ave., at the corner of Hathorn Rd. Voted Oxford’s “Favorite Sushi”… Three years in a row! 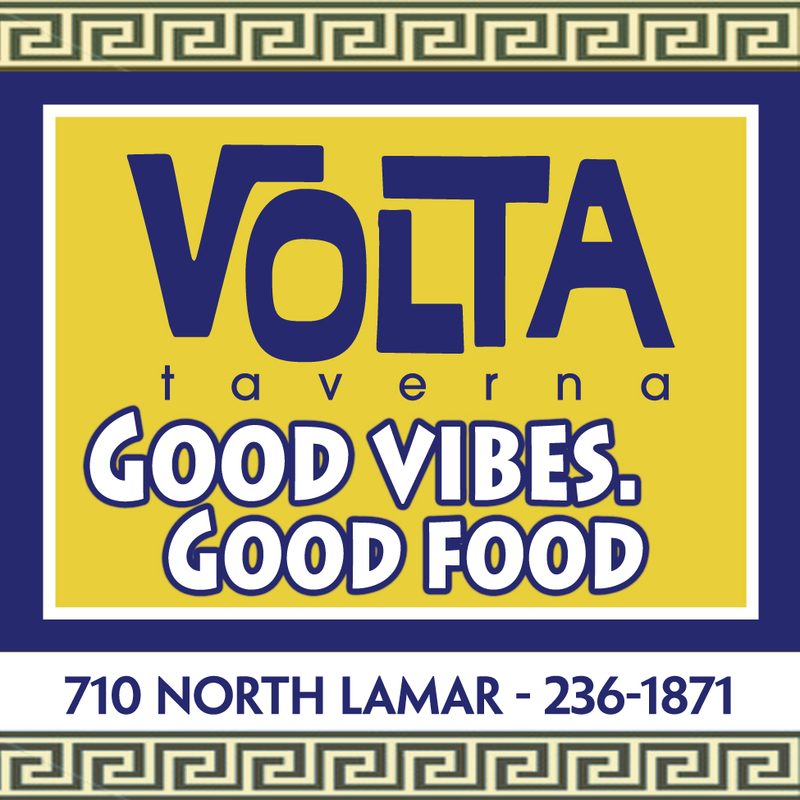 Greek Quesadillas, Hotty Toddy Balls, Lamb & Beef Gyro, Hummus Dip, Pita Pizzas, Soups… Did you know that Volta has amazing WRAPS?Enjoy your day in Oxford on Volta’s awesome patio! 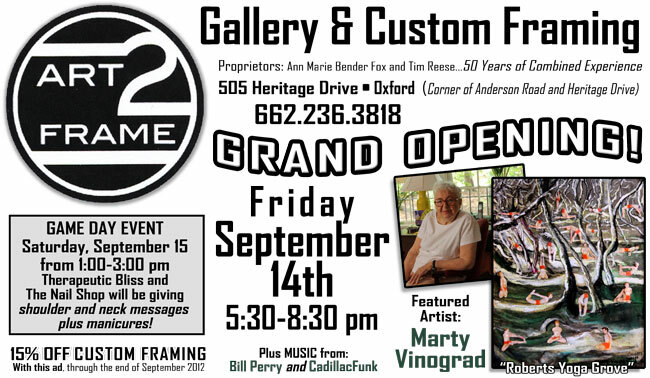 Check out other great businesses in Oxford while you are out having a great time, too! AUSTIN’S MUSIC: Austin’s Music offers lessons for Piano, Guitar, Bass, Vocals, Ukulele, and more. Stop and check out their instruments for sale, too! BIKINI BEER: Beer, Snacks, Tobacco, Ice… Bikini Beer now has a HUGE selection of “Craft Beers”! Check it out. 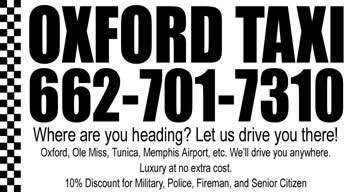 Call in 662-236-2323 and use our drive-thru for easy pickup! 900 College Hill Road, next to Mink’s On The Park. BETTE’S FLOWERS: is located at 1798 University Ave. and has the best and freshest selection of flowers and gifts, plus soaps and candles. Stop by and see. CAMBINOTECH COMPUTER SERVICE: Call now 901-282-7676. Free Diagnostics test! “If I can’t fix it–then it’s FREE!” Student discounts available. DEEP FRIED T-SHIRTS: Owned and operated by Mat Wymer, Deep Fried T-Shirts has been making some of the best and most inexpensive silk screened T-shirts in the area for many years. 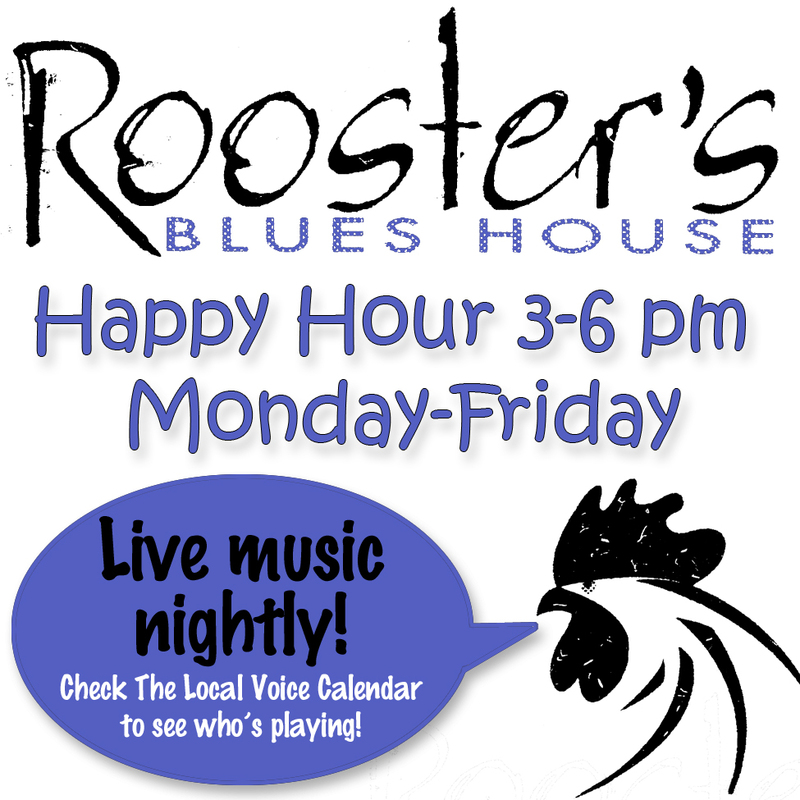 Buy 100 shirts and get 5 free… Call 662-234-1818 and get some GREAT CLUCKIN’ SHIRTS! EXPRESS COMPUTER SERVICE: Oxford’s #1 Computer Shop! Free Diagnosis. Flat Up Front Pricing. Apple & PC Laptop Power Cords Instock. Located at 1501 W Jackson Ave beside The Noodle Bowl & JOS A Banks. 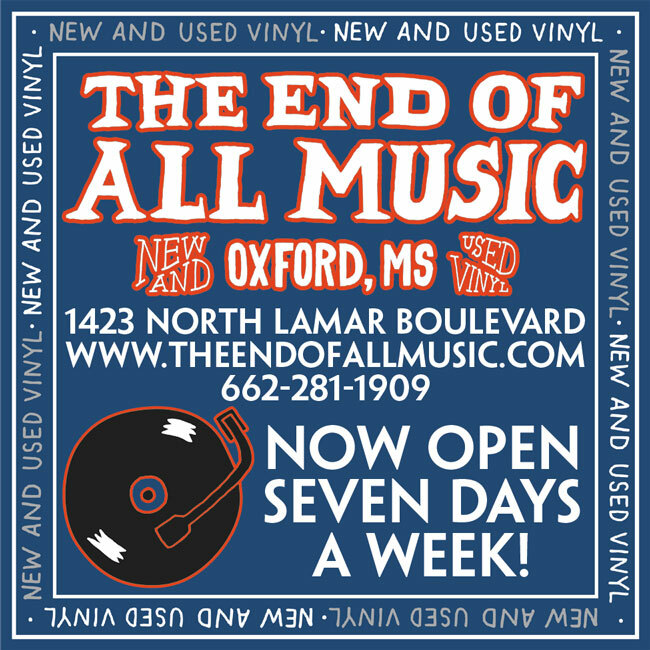 Call 662-236-5670 today for any computer related needs! 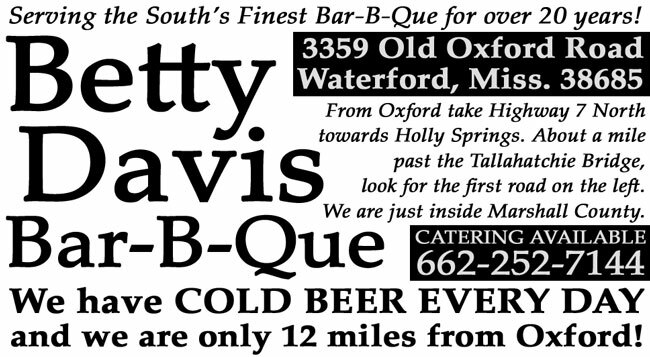 LOCAL COLOR: William “Willy” Wallace has been serving up the weird in Oxford so long, we can’t imagine Oxford without Local Color. If you are looking for unique but inexpensive gifts, visit Local Color on North Lamar Boulevard. REBEL MUSIC: Rebel Music is a full line music store “where musicians serve musicians.” Rebel Music carries Fender, Martin, Mapex, Roland, Takamine, Sabian, Behringer, Mein, Alvarez, DDrum, Gretsch, Paul Reed Smith, Zildjian, Remo, Yorkville, and plenty of consignments. Piano and guitar lessons are available as well as PA rentals and school band rentals. Rebel Music is located at 1605 West Jackson Avenue next to Kiamie’s Liquor and Domino’s Pizza. Call 662-234-0999 and get the help you need. STAR PACKAGE: was voted “Oxford’s Favorite Liquor Store” this year. Stop by and see why – they have a great selection! UDC FIT: “The Road to Fitness is Always Underconstruction.” Visit Master Trainer Dennis Montgomery and his staff to get yourself off to a great start with fitness. Located at 1625 West jackson Avenue 9next to Kabuki). Featuring 24-hour gym, sauna, and towel service. Personal Training and Body Wraps available by appointment. 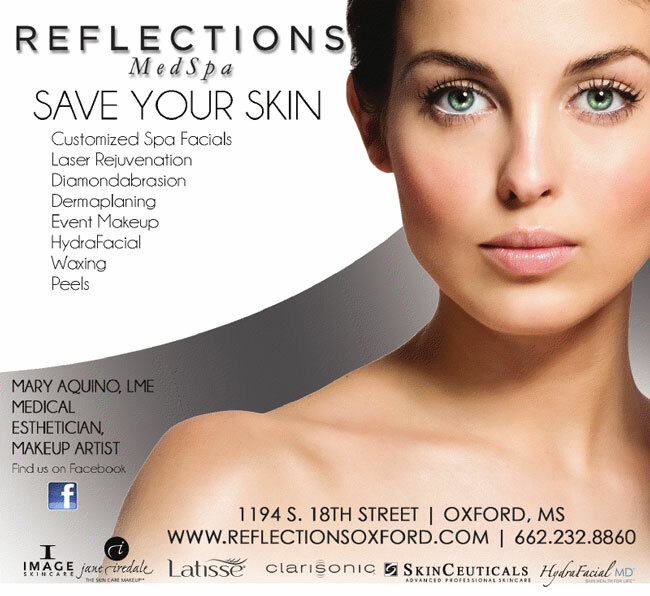 Call today: 662-259-2888. WEST JACKSON LIQUOR STORE: Located next door to Papito’s near Wal-Mart on West Jackson Avenue, this store has easy access and plenty of parking. Download the PDF or pick up a free copy in North Mississippi! © 2012 Rayburn Publishing. All rights reserved.